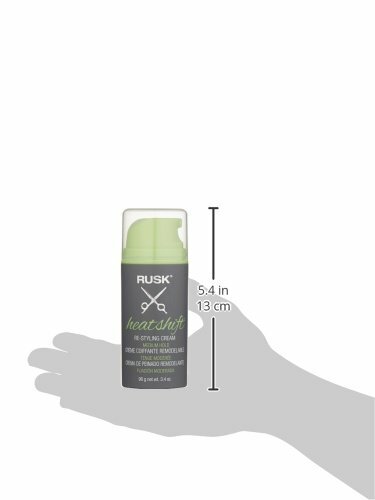 RUSK Heatshift Re-Styling Cream, 3.4 fl. oz. Product prices and availability are accurate as of 2019-04-16 13:49:19 UTC and are subject to change. Any price and availability information displayed on http://www.amazon.com/ at the time of purchase will apply to the purchase of this product. Allows easier styling and re-styling of hair. Provides medium hold with no product buildup. Reduces blow dry and style time by 50%. Developed with Style Strength Complex to deliver color and thermal protection. To use: Apply to damp hair. Style with blow-dryer and styling tool for maximum results. To re-style: Apply heat with a styling tool and re-style. For maximum results, set styling temperature above 120 Degree/50 Degree.